11-13-13, i got to my stand at beanfield at 5:45am.soon as i set down in my stand i heard deer 60 yds to my left rustling in the leaves in the woods.this kept up off and on til at 6:45am i caught movement and a nice 8 pt was in a opening at the edge of the woods.before i could get my scope on him he walked behind some thick stuff.5 mins or so i caught movement again about 15 yds from where the 8 pt was at.this time a small 5 pt was walking in the woods and he stopped and stared at where the 8 pt had went.again i see movement where the 8 pt had been and this time another nice buck with a split g-2 was standing there in the opening.i had the scope on him in a sec and shot and missed ! he looked my way as i chambererd another round and shot again behind his left shoulder. he gave mule kick ran about 20 yds and was down.7:00 am he was mine. 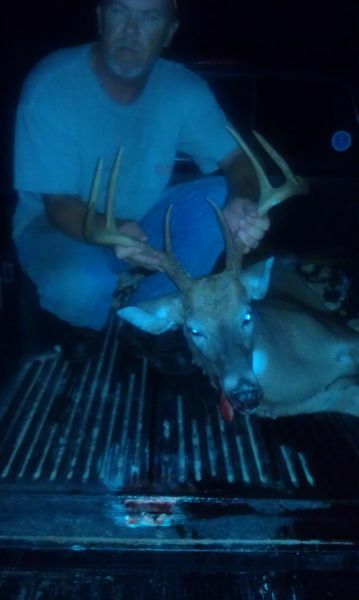 11 total pts, split g-2 and brow on left beam.has long beams with good mass. 11-13-13, i got my stand at beanfield at 5:45 am, soon as i set down, to my left about 60 yds to the woods edge i heard deer rustling around in the leaves. this kept up off and on and as i continued to watch where the sound was coming from i caught movement in a opening at 6:45 it was a nice 8 pt. before i could get my scope on him he walked behing some thick stuff. 5 mins or so i caught movement again about 15 yds from where the 8 was and saw a small 5pt walking and he suddenly stopped and stared towards where the 8 pt went. again i caught movement where the 8 pt had been and another nice buck stepped in the opening but i could see his left g-2 looked forked. i had the scope on him in a sec and squeezed off a shot and missed !!!. he looked my way and i chambered another round and placed it behind the shoulder and shot this time hitting him , he gave a mule kick ran about 20yds or so . nice mass with long beams, split g-2 and split brow time. 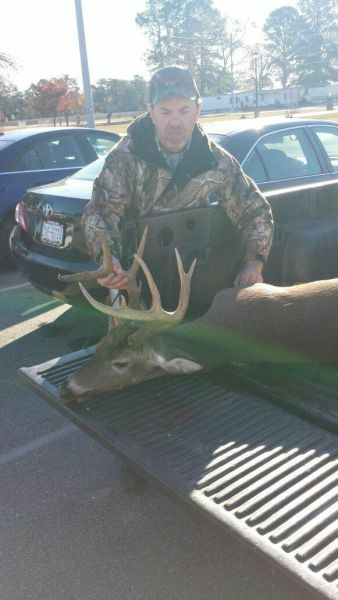 shot this buck 11-9-13 at 4:30 pm. 4 does came out and he was about 5 mins behind them. he chased them all over in front of me before i decided to shoot. 1 st deer shot on this farm in 3 yrs. i haven't hunted it but twice this season. alotta buck sign and been seeing alotta yearling buckks on the prowl on our other farm i been hunting. this should be a good week. deer here been moving of a morning right at daylight and early afternoon. hope the biggun shows soon!!!! shot this 8 pt 10-16-13, about 30 mins before dark a nice 6 pt came out in bean field 75 yds from my stand noticed he kept looking back towards woods and several minutes later the 8 pt stepped out and starting eating beans. i watched them both about 10 mins and when the 8 pt turned broadside i shot 1 time and he ran to my right with the 6 pt along side him. i shot 3 more times and the 8 pt went down in the beans about 150 yds away. not sure if he was dead i eased towards where i last saw him. the nice 6 stood there close by til i got close and then he ran off. when i found the 8 pt wasn't sure if he was dead or not the way he was laying but upon getting closer and bumping him seen he was. my shot was a little far back in the rib cage with the 1 st shot hitting him and 1 of the other 3 shots passing thru his left beam. pure luck it didn't break the left side off took about half of the beam out on the exit side. 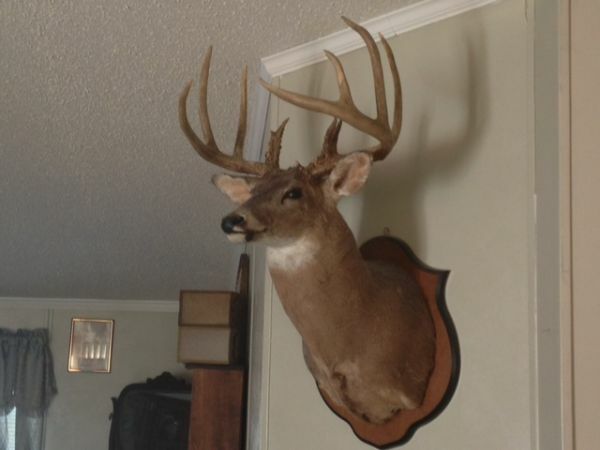 anyway good hunt and think i'll do a euro mount on this 1.been seeing alotta small bucks with good potential. taking next 3 weeks off and gonna hit'em hard. it's been 7 yrs since i'd been to classic and man ol man has it changed. nutting against the other stuff but i'm more into the deer stuff itself. i could stare allday at the antlers, lol. guess they're trying to pull people from all walks to the classic now. the scoring of heads well seems it was cluster **** part of the time. wrong scores with wrong heads, gross scores no net scores and vice versa..lol. they lost 1 of my score sheets and i found it with a skull mount and when i told 1 of the fellows it was incorrect he looked at me like i wuz crazy.all in all had a good time and it's the fun of meeting other hunters and looking at the nice deer taken. i've said it before it's not as much the score as it is the enjoyment of the hunt!! including cpl pics of 2 ,i carried, took 3 but the 3rd half his head is gone in the pic so i didn't upload. congrats to all hunters this yr and hope the coming one will be successful to. posted pic under another post not sure if everyone seen it so thought i would post again. 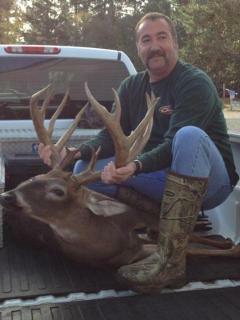 buck was killed 2012 in bladen county, my taxidermist caped him out and is mounting him. he told me deer rough scored 199+ and he has mounted alotta big deer! 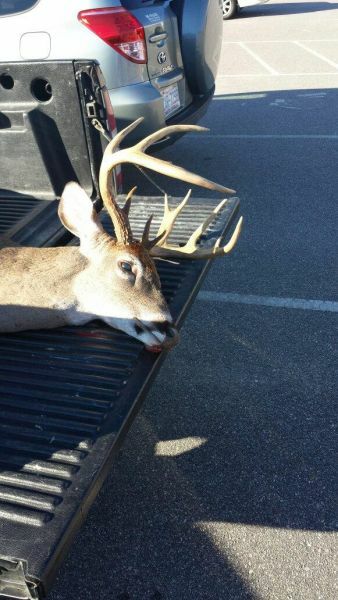 he said fellow that shot him has the antlers for the 60 day drying period and then will have them officially scored. don't blame him i'd keep them under lock and key..lol the pic i got from a friend who knows the guy that killed him. 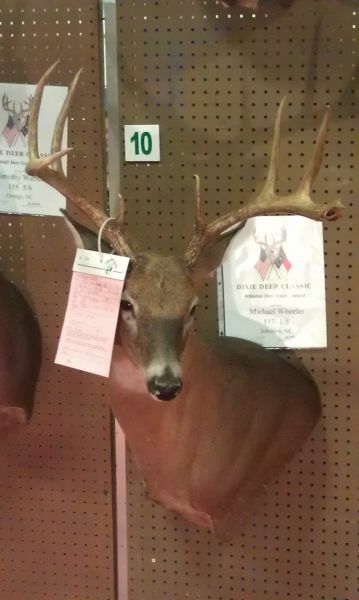 taxidermist told me he was a main frame 12 and he didn't know how b&c would score him but he would make b&c. beams are massive.guess we'll see how he tapes out after the 60 day period. giant no matter what to me. any joco duck hunters here ? Any Johnston county duck hunters on here ? i just witnessed today , at dusky dark, a young fellow shoot at group of 8 deer in field front of my house. heard vehicle stop looked out door saw the deer he turns around in highway leaves about 5 mins comes back , stops shoots at the deer from the road in his truck. man that makes me MAD!!!!! !.i hunt by the rules and over a week after season this happens. i've found 2 dead does in the ditch very close by home last couple of weeks and pretty sure they met the same fate. i called wildlife commission report it and get a call back from wake county officer that the johnston county officer was unavailable. i'm not mad with them but we law abiding hunters should get some kinda service when needed. just makes me sick and mad as h_ll that this happened. right under my nose in plain sight. don't know if deer was hit or killed got dark to quick. i hope for deers sake he missed. it was very hard to watch pickup just drive off after this with me looking. just felt like sharing this and hope no one else has this happen to them! 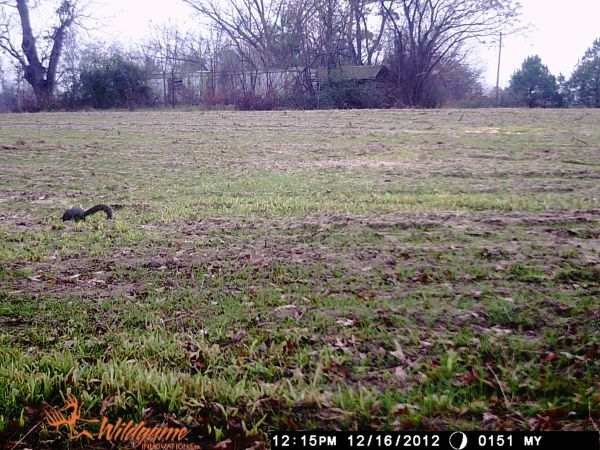 couple of trail cam pics of fox squirrels in field. 1 is black other is greyish black. sometimes seen as many as 6 at one time while deer hunting. 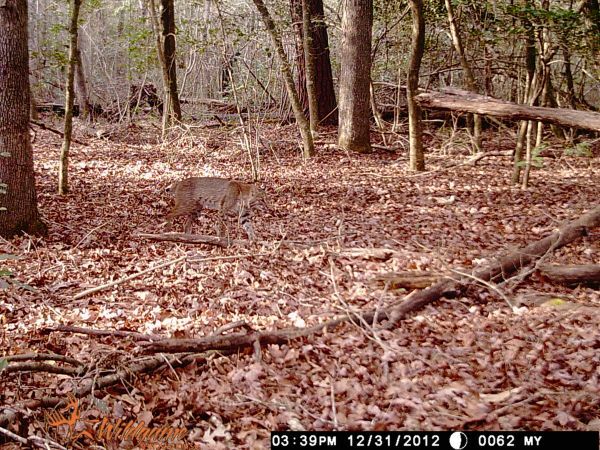 got these pics of bobcat &coyote on trail cam. we are over run with coyotes this year. they really put a damper on deer movement latter part of season. this is my son with his 1 st buck / deer. i've carried him deer hunting since he was old enough to wanna go. when he was younger i would sit with him and as he got older he would sit in a stand by himself. he would see a few deer now and then and some times a small buck. he would never shoot anything and i ask why. he said i don't wanna shoot a little buck daddy i wanna kill a big one. i was happy at the same time kinda sad. i wanted him to shoot a deer while hunting with me even if it was a small buck. several yrs later 11 / 3/ 10, we went hunting on our farm and i ask him where he wanted to hunt he told me so i went about 200 yds to another field. about 4:15 i hear a gun shot but it kinda startled because it was behind me. also i just had got to my stand. i thought a second or so and called my son, finally answering his phone i said did you just shoot ? he said yes and daddy i think i got the biggun. i run to my truck drove to where i left and didn't see him. look to my left and saw him and the deer about 75 yds away. so i backed the truck down the field to him really not expecting to see much horns on the deer and when i stopped got out and walked to the back of the truck my bottom jaw almost fell off. it was a really nice buck and my son was on top of the world. after struggling to load him and getting home, we looked him over. 6 pt, 5' bases, 10' g-2's, 18's inside spread. very nice buck. so i'll stop now and just say this was the best hunt of my life and hope many more fathers will experience the same thrill i had. 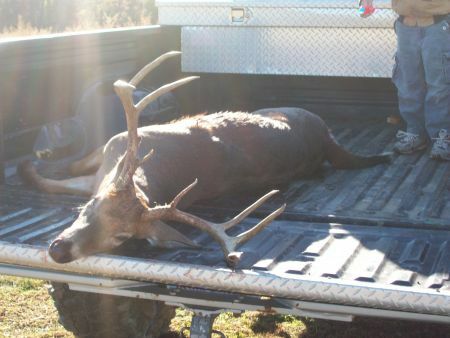 just thought i'd share pics of my 2 bucks taken 2012,1st 8pt taken afternoon of 10/19/12, 2nd 8pt taken afternoon of 11/6/12, johnston county. coyotes have put a damper on hunting since thanksgiving. nice buck !!! fellow jocohuntr here. nice buck, fellow jocohuntr here. have ya got a joco buck yet ? 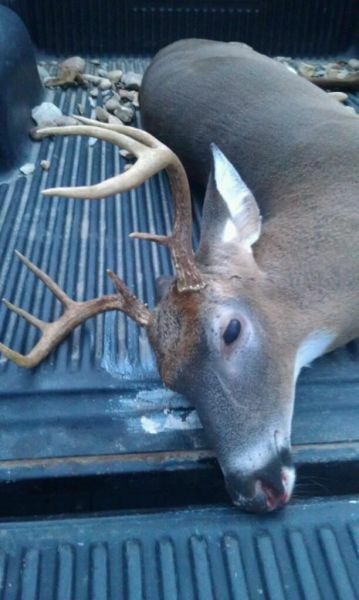 nice buck..... i'm glad ya got him. thanks duplin huntr,,, had any luck yet ? here's pic of this buck only pic i got of him and never saw him again until i shot him. congrats on her 1 st buck. good to see ya getting your daughter into hunting. remmember my 1 st deer.. button buck 1979 whewww i feel old. i know what ya mean alot do i bet. i shot this one with 30-06 150 gr core lock. here's pic showing where bullet hit on right side above brow tine. congrats on the big 6 ! i'm with ya on the coyote, it's not a wolf, i've seen a cpl round here looks exactly the one in the above pics.black phase coyotes are around. some coyotes are the hybrids mixed with grey wolves and have migrated here. they get alot bigger than the western coyotes. no matter which kind... they are hunters and scavengers. 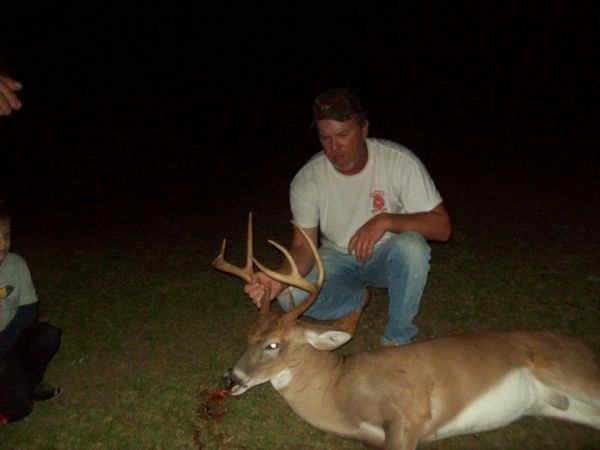 welcome to the site !, comgrats on your buck and the nice drum in other pic. keep huntin and i hope ya get the biggun !!! ncoutdoorsman, i see in your profile you like predator hunting,we're not far apart, think ya might be up for some coyote hunting ?, gotta plenty of'em and need to try an take some out before the does drop fawns. ncoutdoorsman, 1st of all i've killed my share of little bucks over the yrs but realized that why shootem if i wanna hopefully see big bucks.i'd also like to say when deer season is i hunt everyday i can rain, heat, cold whatever, my wife says i'm addicted to shooting big bucks..lol i have nothing against anyone shooting young bucks but when the young bucks are killed for sure you'll never know what he coulda been.i'd guess my biggest thing is where i hunt hardly any pressure. i don't tramp all over the woods, hardly ever hunt the woods.i hunt fields 1 in particular that with some sitting time usally pays off. yrs ago i hunted the woods and seen alot less deer, not saying that hunting woods is bad , hut since i've changed my strategies of hunting fields and not woods it has paid off.if it works why change right ? ?.i kinda think of it as their sanctuary and not to disturb them unless trailing a deer. my experience has proved to me here that if left alone and minimal pressure they travel in the fields ok.i've tried food plots, clover , chickory , etc.no good here reckon because of crop fields. sweet taters, soybeans. let me just say in my opinion a bean field is hard to beat even after they dry out.i keep corn out during season as an attractant and it does help keepem close especially after acorns are gone. i've shot some nice bucks and seen some i didn't shoot. i've let some nice 1 1/2 - 21/2 yr olds walk hoping they mature, some i never see again..lol everyone has their own way of hunting and i'm sure some locations my style hunting might not be as good. i made oath to myself not to shoot any deer unless i have him mounted and much as that cost it's easier to keep the safety on..lol. all in all i just love being outside and being able to hunt and enjoy gods creations. good luck to ya ! thanks fellows, ncoutdoorsman the biggun grossed 165 4/8, net 151 5/8, a lil over a inch broke off of g-4 when i dropped him in drive way. if he'd had matching g-4 on other beam he'd grossed well over 170 but i'm happy anyways.i'm bout 7-8 miles from lowgrounds.i have 2 more 8pts gross over 140, shot and missed a 8 pt last yr at 40 yds 22/23's inside pushing 160 and missed with my rifle , he was a unbelievable buck. that's a nice buck you took hope more come your way. i love the outdoors, i've hunted and fished since i was a young boy. born and raised on a farm i've had alot of time to enjoy the outdoors. i love deer hunting it's my passion. there's nothing like hunting here at home and enjoying the outdoors among all of nature.i taught my son gun safety and about hunting when he was young. he's now grown and still loves to hunt but mainly for ducks. just like to say i love the thrill of a big buck good as anybody, but i've learned to appreciate just watching wildlife in a natural setting even if i don't get the big one.i've been fortunate in my hunting to harvest some nice bucks, my best being a 165 4/8 ' 9 pt with a split brow which would be considered a 10 pt. nothing like getting a big buck on home ground to me. 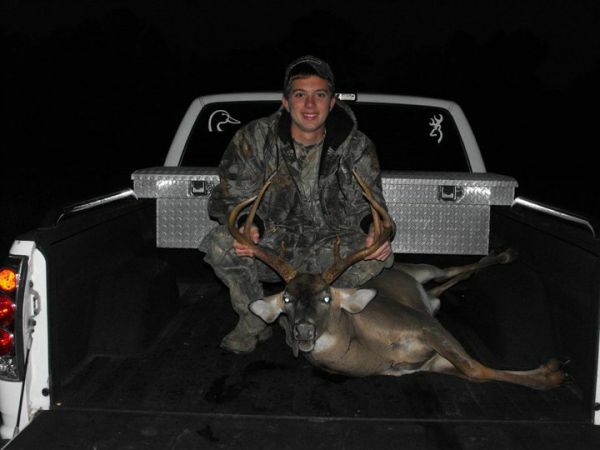 johnston county bucks my passion.